Back in October, we reviewed the new $1299 entry-level iMac, the first of the new iMac models that we could get our hands on. Regrettably, it took us a while to get the other three standard-configuration iMacs in the Macworld Lab to test. We finally took a good look at the rest of Apple’s iMac line. Externally identical to the slim-edged 21.5- and 27-inch iMacs released in October 2012, the updates in this batch of iMacs are all internal, featuring more powerful processors and support for faster 802.11ac Wi-Fi. The new iMacs come in four standard configurations, two 21.5-inch models and two 27-inchers. All use quad-core Intel i5 (Haswell) processors, 8GB of memory and 1TB hard drives. The 21.5 inch models use 5400-rpm hard drives while the 27-inch iMacs use faster 7200-rpm drives. Also, the memory in the 21.5-inch iMacs is not user upgradeable, whereas the 27-inch iMacs ship with memory in just two of its four user-accessible DRAM slots. I’ve already reviewed the entry-level $1299 iMac that comes with a 2.7GHz quad-core Core i5 processor and Intel’s Iris Pro integrated graphics. The $1499 model has a faster 2.9GHz quad-core Core i5 processor and Nvidia GeForce GT 750M discrete graphics with 1GB of video memory. The $1799 27-inch iMac features a 3.2GHz quad-core Core i5 processor and Nvidia GeForce GT 755M discrete graphics with 1GB of video memory. The high-end $1999 stock iMac has a 3.4GHz quad-core Core i5 processor with Nvidia GeForce GT 775M discrete graphics with 2GB of video memory. These new iMacs have the same four USB 3.0 ports, dual Thunderbolt ports, SDXC card slot and gigabit Ethernet port as the late 2012 models. The new iMacs do not include Thunderbolt 2 ports found in the latest Mac Pros and MacBook Pros or FireWire ports found in iMacs predating the late 2012 models. As with its predecessors, the new iMacs feature glossy screens with LED backlights and IPS panels. The resolution of the widescreen displays remain at 1920 by 1080 on the 21.5-inch and 2560 by 1440 on the 27-inch iMac. The IPS screen gives the iMacs excellent viewing angles with no loss of contrast or color shifts as you move away from the center of the screen. The glass cover is adhered to the display, not held on by magnets like the aluminum iMacs released before 2012. While this and other changes help to significantly reduce glare on these recent displays, it makes it much harder to service the 2012 and later iMacs. If you think you might want a larger or faster internal drive, it’s best to customize your iMac at the time of purchase. Available options for the $1499 21.5-inch model include 256GB or 512GB of flash storage ($200 and $500, respectively) or a 1TB Fusion Drive ($200) which marries 126GB of fast flash storage and 1TB hard drive into a single volume that performs much like an SSD, but with the capacity of a hard drive. Upping the RAM from 8GB to 16GB will cost $200. The higher-end 21.5-inch iMac’s processor can be upgraded from the standard 2.9GHz Core i5 to a 3.1GHz quad-core Core i7 processor for another $200. Options for the 27-inch models include the same storage choices as the 21.5-inch iMacs but add an available 3TB hard drive for $150, 3TB Fusion Drive for $350, or 1TB of flash storage for a cool $1000. The 27-inch models can also be configured with 32GB of RAM for an additional $600. 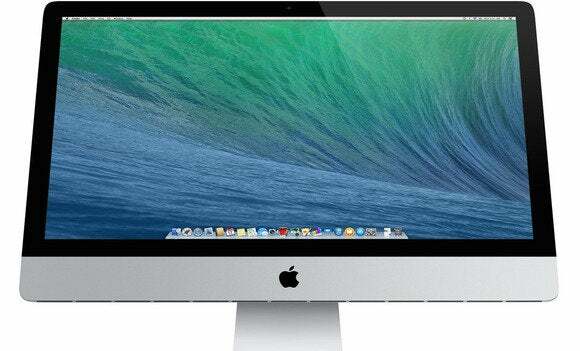 The high-end 27-inch iMac can be upgraded to include a 3.5GHz Core i7 processor for $200 and graphics can be upgraded from the 2GB GeForce GTX 775M to a GTX 780M with 4GB of video RAM for an extra $150. All results are scores. Higher scores are better. Stock configurations tested, except where noted. Best score in bold. Reference models in italics.—Macworld Lab testing by James Galbraith and Albert Filice. We used our Speedmark 9 benchmark suite to gauge the performance of the new iMacs. The $1499 iMac was 5 percent faster overall than the 2012 2.9GHz quad-core Core i5 (Ivy Bridge) iMac it replaces. iPhoto, Photoshop and MathematicaMark scores were within 2 percent between these new and 2012 iMacs. The 2013 2.9GHz iMac was 20 percent faster in iMovie, thanks to improvements Intel made in its Haswell processor’s Quick Sync Video feature. HandBrake encoding was 17 percent faster on the new $1499 iMac. Interestingly, all of the new iMacs were slower than their predecessors in our folder Zip and Unzip tests. At first we thought it was the hard drive, but both the 2013 and 2012 low-end 27-inch iMacs use the same 1TB Seagate Barracuda ST1000DM003 drives. Watching at the processor utilization during the Zip test, we noticed that the test uses a single processor. We saw that while the Haswell processor in the 3.2GHz 2013 27-inch iMac would run at a higher rate than the 2.9GHz Ivy Bridge processor in the 2012 27-inch iMac (both can go up to 3.6GHz in Turbo Mode), the Haswell processor often dropped as low as 800MHz, while the Ivy Bridge processors maintained a more consistent speed—falling to 1.6GHz occasionally, but not as often as the Haswell. We also tried the Zip test with a 480GB Thunderbolt Helios +E2 drive, and the 2012 iMac was only a bit faster with the Helios, but the new iMac with Helios finished the task 130 seconds faster, in line with the older iMac. It’s possible that Haswell’s energy-saving features are kicking in as it waits on the slower hard drive to provide data to crunch. We're investigating this and will update this review when we have an explanation. Like the 21-inch iMac, the new low-end $1799 27-inch iMac was also 5 percent faster overall than its predecessor. The new model was 14 percent faster in our HandBrake Encode test 28 percent faster in our iMovie test. The new iMac’s Nvidia GeForce GT 755M graphics helped the system post 17 percent higher frame rates in the Cinebench OpenGL test than the GeForce GTX 680M graphics in the older iMac. The high-end $1999 27-inch iMac was 15 percent faster overall than the 2012 high-end stock iMac. It was also faster than the older iMac in all but the aforementioned Zip and Unzip tests. Highlights included a 42 percent faster iMovie test results 18 percent faster Handbrake times and 28 percent faster files and folder copy times. Tests of our CTO 27-inch iMac show that the Fusion Drive and processor upgrade definitely give the custom iMac a nice performance boost. The custom 2013 iMac was 39 percent faster overall than the top-of-the-line stock $1999 iMac. The CTO iMac’s 3.5GHz quad-core Core i7 processor helped it outpace the high-end iMac and its 3.4GHz Core i5 processor in Cinebench’s CPU test, MathematicaMark, and HandBrake by 25, 19, and 16 percent, respectively. The 6GB folder copy test took just 41 seconds on the custom iMac with Fusion Drive, versus 103 seconds on the high-end stock iMac. The new iMacs have the same strengths and weaknesses as the 2012 iMacs that ushered in the current design : strikingly thin-edges and decreased screen glare, but at the cost of eliminating the optical drive from the iMac line and RAM upgradability in the 21-inch models. The new models are faster than their predecessors in most tests, but CTO options can really increase performance.